A sweet spin on a sheet cake to give it some Texas Style! In a large saucepan, bring butter and water to a boil. Remove from heat; stir in the flour and sugar, eggs, sour cream, almond extract, and baking soda until smooth. Pour into a greased 15in x 10in x 1inn baking pan. Bake at 375 for 20-22 minutes or until a toothpick inserted near the center comes out clean and cake is golden brown. Cool for 20 minutes. For frosting, in a large saucepan, combine butter and milk. Bring to a boil. Remove from the heat: stir in sugar and extract. 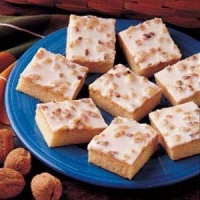 Stir in walnuts, spread over warm cake. I always make the chocolate one; will have to give one a try soon. Love the chocolate one, but I'll love this one even more! Like brinbrits's recipes? Never miss an upload!